Wilhelmina Barns-Graham, O.B.E. (1912-2004), known to her friends as Willie, was born in St Andrews, Scotland, and showed signs of creative ability from early on. 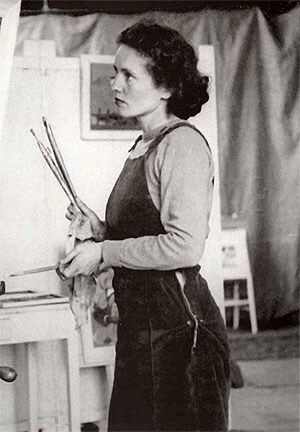 While still at school she decided to become an artist and set her sights on Edinburgh College of Art, where she enrolled in 1931. The college’s principal suggested that she moved to St Ives, Cornwall, in 1940, partly to escape the war and partly because the principal thought the art scene there would be of interest to her. She quickly became part of the group that included Ben Nicholson and Barbara Hepworth and Margaret Mellis, whom she knew from Edinburgh. She was a founder member of the Penwith Society in 1949. She travelled regularly over the next 20 years to Switzerland, Italy, Paris, and Spain. With the exception of a short teaching term at Leeds School of Art (1956-57), and three years in London (1960-63), she lived and worked in St Ives with regular stays in St Andrews where, in 1992, she received an Honorary Doctorate from the University. In 1999, Wilhelmina Barns-Graham was elected an honorary member of the Royal Scottish Academy (RSA) and the Royal Scottish Watercolourists (RSW). She also received Honorary Doctorates from the Universities of Plymouth and Exeter. In 2001 she was awarded CBE. In 2001 Lund Humphries published a study of her life and work.